Legal news for Maryland wrongful death attorneys – Widow of man killed in 2008 medevac crash has filed suit against the federal gvt., claiming air controller negligence. 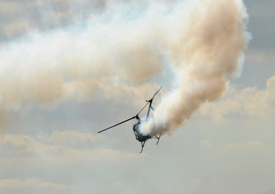 Air traffic control gave helicopter pilot bad information, resulted in 3 deaths. Greenbelt, MD (www.NewYorkInjuryNews.com) – On March 12, 2010, the widow of a flight paramedic killed in a 2008 helicopter crash filed a suit against the federal government for $15 million, alleging negligence on behalf of air traffic controllers, as reported by the Washington Post. Paramedic Mickey C. Lippy, 34, was one of four people killed during a medevac flight that was trying to deliver two teenagers from a car accident in southern Maryland to Prince George’s Hospital Center. Amid gathering fog and darkness, the helicopter pilot descended too quickly in attempts to avoid the deteriorating weather. The lawsuit, filed on behalf of the paramedic’s widow and his two-year-old daughter, states failures of the controllers as contributors to the crash. It claims the controllers were negligent in that they allegedly relayed hours-old weather information to the pilot and inadequately handled the flight before the crash in District Heights. The suit was filed in U.S. District Court in Greenbelt. It does not name Maryland or state police. The federal government has approximately two months to respond to the filed suit. One patient that was onboard for the crash survived, but was left with severe injuries.